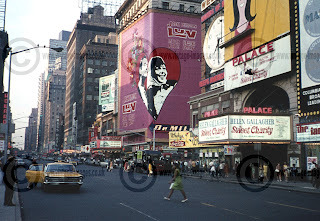 The top of Times Square at 7th and 47th Street in 1967 with Sweet Charity playing at the Palace Theatre, which in its heyday in the early years of the 20th century was the most prestigious booking in America. All the major stars played there. It was converted to a cinema in 1929 and RKO's Citizen Kane had its world premiere here in 1941. Frank Sinatra, Judy Garland, Danny Kaye and others appeared here while it was a cinema in an effort to rekindle Vaudeville appearing before the main film, but although these were successful it did not lead to Vaudeville making a comeback. 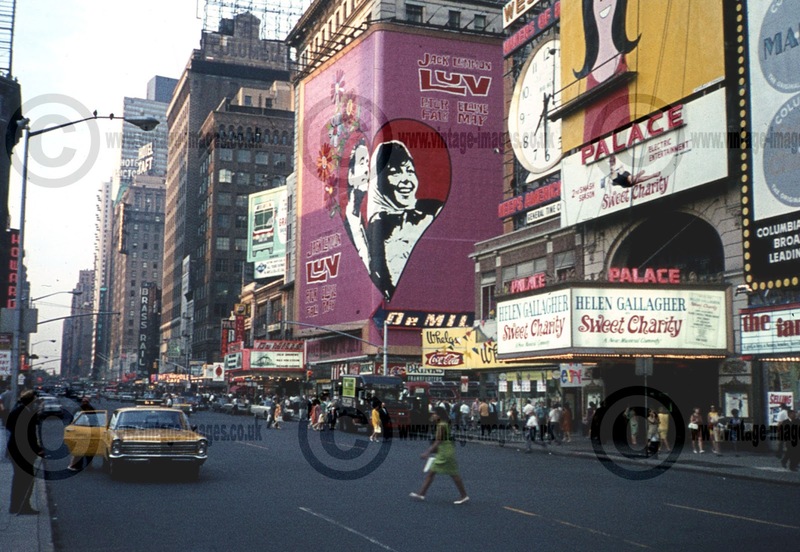 However in 1966 it reverted to being a theatre again and the original run of Sweet Charity was the first production staged and ran for 608 performances. Films were still shown between theatrical runs and concert performances were staged for a time as well. It is still a theatre today. Luv, with Jack Lemmon and Peter Falk is advertised in an enormous hoarding across the street on a building that isn't a cinema! (It is difficult to discern exactly what the buildings are behind all the advertising that is the hallmark of Times Square). This was a now almost forgotten 60s "comedy" film that had poor reviews and I certainly cannot remember it ever showing on TV in the UK. It was, surprisingly based on a 1964 Broadway hit but the transfer to the big screen was not apparently handled well despite some big stars appearing in it. One of New Yorks ubiquitous yellow cabs picks up (or drops off) a passenger, but 7th Avenue looks suspiciously quiet. The traffic lights have held up the traffic, and when they turn green the traffic will thunder down 7th again. In the middle distance is the Brass Rail restuarant at 745 7th Ave. It was a well known eatery for years and apparently was still open for business in 1980 but I cannot find a date when it closed. The Hotel Taft, opened in 1926 as the Hotel Manger, was renamed in 1931 after the former president who had died the year before. It closed in the early 1980s and has been refurbished as apartments but now only the first seven floors are used as a hotel, The Michaelangelo. The DeMille Theatre was made into a multiscreen in the 1970s and closed seemingly in the 1980s and was empty for years but in 2007 it was gutted and converted into a restuarant. With more original images of New York available from as far back as 1939 we will be visiting again, but with the next image that I post we shall return to the UK.